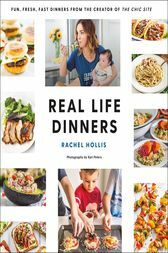 RACHEL HOLLIS is the founder of TheChicSite.com, where readers can find recipes, as well as party planning and lifestyle advice and the author of the New York Times bestseller Girl, Wash Your Face. She also founded the event planning firm Chic Events, and six years later Inc. magazine named her one of the top thirty entrepreneurs under thirty years of age. She is a regular contributor to the Huffington Post and PopSugar, and she has appeared on The Rachael Ray Show, The Talk, Extra, and many more shows. She lives in Texas with her husband and four children.